Now, I'm not a gambler by any means. But I have made enough money from bookmakers in just six months to pay for an £860 flight (return) to Australia. And I've got some company too after walking a good friend through this risk-free technique. The result is this guide, where I'll share the exact steps with you too, including screenshots and a free tool. What I'm teaching you here is a completely legal, tried-and-tested method called 'matched betting'. Matched betting basically allows you to turn the tables on the bookmakers to extract their free bet offers. I've used it myself for several years and have never lost any money doing it, but I have taken my time and been very careful to avoid making mistakes. I'll be taking you through the 'need-to-knows' then showing you how I made £13 in 20 minutes in a full-blown example. Matched betting is a technique that mathematically guarantees a profit from the many free bet promotions offered by betting companies. Almost all bookmakers advertise these offers (especially during big sporting events) to entice new customers to place bets with them. For example, "bet £25 with us and we'll give you a £25 free bet!". Betting for a certain outcome to come true. Eg. "I bet England will win" is a backing bet. If it comes true, you win the bet and the winnings. If England lose or draw, you lose your stake. You can place a back bet at any bookmaker, such as Paddy Power, William Hill, Ladbrokes etc. Betting against a certain outcome to come true. Eg. "I bet England will not win" is a lay bet. If they lose or draw, you win the bet. You can only place a lay bet at a betting exchange such as Betfair. Matched betting works by cancelling out the risk on the 'back' bet at the online bookies by betting against yourself at the same odds (know as 'laying' a bet) which you can do at a betting exchange. In other words, you are 'matching' your bet. Following your first or 'qualifying' bet, you will then be awarded the free bet by the bookmaker. This is where the profit is made. Quite simply, you repeat the process: bet using the free bet and then lay the bet. Whatever the result you are guaranteed to make a profit (which I'll be demonstrating below). In the steps below I'll show you how to profit from a £20 free bet using a real life example. Replicate the same steps across the hundreds of free bet offers each year and you can quickly be looking at £1,000s. And it's worth pointing out, earnings from the gambling industry are currently tax-free. Once you've understood the process and been successful by following the steps below, you can then continue matched betting at many other online bookies with free bet offers (see my table at end) which can quite quickly land you a lot of money without risk. It's also worth knowing that depositing at gambling websites does not affect your credit rating. Get My FREE Matched Betting Course! I'll share the best offers, common mistakes and how to make £600 every month. You'll also be invited to join my Private Facebook Group to ask me anything. Note: This is literally a step-by-step, hold-your-hand kind of guide. There's lots of fragmented information out there on forums etc, which often results in costly mistakes for novices. Below I outline exactly the steps I follow, using the practical example of one free bet with Coral. So long as you follow word for word, you can't go wrong. I strongly suggest reading through all the steps first before making any bets. You'll also find using a desktop computer far easier than on mobile! Betfair is a betting exchange where you can 'lay' bets to cancel out your risk at the bookmakers. They sometimes even offer free bets for new customers too (if you're lucky). Seeing blank pages? Turn off Ad Blocking plugins when matched betting! The best offer by far right now is with Coral who are offering £20 free bets on new sign ups when you bet just £5 (don't worry we'll be matching this too). So we'll be using this 'bookie' in this practical example. Always check the full T&Cs of receiving free bet offers. There may be some restrictions on what you can bet on or an expiry date. 18+, UK & IRE only. Minimum first bet £5. Must be placed within 14 days of account registration. £20 credited as 4 x £5 free bets. Not valid with CashOut. Free bet valid for 4 days. T&Cs Apply. During registration, you will be prompted to make a deposit. Choose one of the many payment types and deposit just £5 (needed to unlock the free bet). Once you've logged into Coral.co.uk, change your odds display from fractions to decimal for easy comparison with Betfair. You can do this from the link in the top menu across the site. This is essential! Ideally you want to find a sporting bet (I recommend football) which has the closest odds on both Coral.co.uk (the bet to back) and Betfair.com (the lay bet). Lay odds on Betfair are the red boxes, not the blue. If you cannot see any red boxes, you need to go to the exchange by clicking the top left link "Go to Exchange" or "Exchange". For this free bet offer, Coral's terms state you must pick odds of 1.5 or greater. It's better to choose a bet with low odds for this step, between 1.5 and 4.0 if possible. See my example below then use the Oddsmatcher tool which does everything for you! I used the Oddsmatcher below which suggested a football match between Liverpool and Sevilla, so I went to find this game on Coral and Betfair (we want the "Match Result" market on Coral and "Match Odds" on Betfair). I will back Liverpool to win at Coral.co.uk with odds of 2.25 and lay that same bet on Betfair.com with odds of 2.36. In my example bet, the difference is 0.11 which the Oddsmatcher calculated as giving me a small acceptable loss of 37p on this qualifying bet. Use the Oddsmatcher tool below. This will save you a LOT of time and maximise your overall profit. It fetches live odds from Coral and finds the equivalent lay odds on Betfair for thousands of upcoming football matches. The hardest part is also done for you, which is to calculate the best matches for your qualifying bet based on the closest possible odds and smallest loss. Feel free to switch between them and the steps and calculations will be updated (below the table). Just click the blue refresh icon to start and then follow the 4 steps. Mobile users: The widget may not work properly. Use on a desktop if possible or tap here to open widget in a new window. You need to have iFrames enabled. Try another browser. In my Liverpool v Sevilla game, Sevilla won 3-1. So my profit of £4.87 (the "Backer's Stake") ended up in Betfair, which after commission is £4.63. Meanwhile I lost the £5 bet with Coral. The total amount between the accounts is therefore 37p, as calculated by the Oddsmatcher. As I have placed and seen through the £5 qualifying bet, I now have a £20 free bet! My Betfair account is up to £14.63 (my initial deposit of £10 + £4.63). So whatever the outcome, because you matched the bets, you have close to your initial deposits back between the 2 websites (minus the small loss we expected). The free bet of £20 will be credited to your Coral account. We're basically going to repeat the process in step 4, but using the £20 free bet instead of the £5. The £20 free bet will usually be received as 4 x £5 free bets, so simply place them on the same event as separate bets. 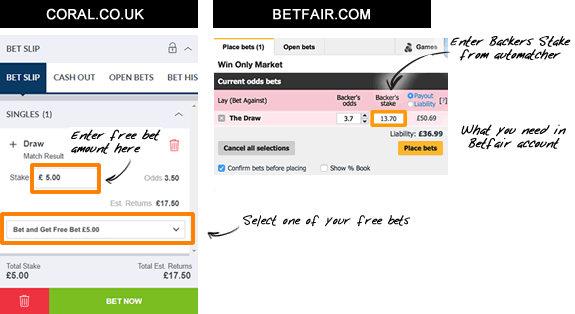 This time it's worth picking odds greater than 3.0 to maximise your profit, but just bear in mind that the higher they are the more you'll need to have in your Betfair account to lay it (see the "Liability" amount in the tool below). I used the next step of the Oddsmatcher (embedded below) which suggested a football match between Crystal Palace and Manchester United. The odds are above 3.0 and have only a 0.2 difference between the websites. You'll see below that I am backing a draw on Coral (3.5 odds) and then I'm laying that bet (for a draw not to happen) at Betfair (3.7 odds). On Betfair I already had £14.63 remaining from the first bet, so I deposited £23 to more than cover my calculated Liability (total £37.63). Just click the blue refresh icon to start and then follow the 3 steps. Once again, feel free to switch between the matches in the table and the calculations will be updated. Whatever the outcome, you will now be in profit to the amount calculated in the Oddsmatcher. Now it's time to cash out! In my example of the Crystal Place v Man Utd game, the score ended in a draw at 1-1. This means my Coral £20 free bet won (because I backed a draw to happen) with a return of £50. Meanwhile I lost the £36.99 Liability on Betfair. So £50 (winnings) - £36.99 (liability) = £13.01. This is exactly the amount of profit calculated for me by the Oddsmatcher. If you are confident enough with the process of matched betting and eager to make much more profit, work through the free bet offers in the table below (ordered by ease). The same key steps above still apply, and I've written a mini guide for each one. All offers are 18+. Always check the full T&Cs. The table below is just the tip of the iceberg. Lots more free bet offers come and go, never making it to this page. Every day I scout around for any new ones, and share them only with those on my email list. Note: Although the greatest care is taken and these free bets are reviewed regularly it's important that you check the full terms and conditions of each free bet offer after clicking through to the bookmaker's site. Matched betting is completely legal in the UK. It takes advantage of a loophole between betting exchanges and bookmakers, but neither of them lose out because not backing or laying elsewhere has no influence on their result from your matched bet. Some people assume matched betting is illegal because it’s almost too good to be true. But it’s legit (assuming you’re over 18)! You can signup here for information on some nifty software we are about to launch that tracks all your matched betting activity! How do I find more free bets? Bookies also offer existing customers free bets and bonuses, called ‘reload offers’. These are designed to keep their customers coming back to them. There are also more signup offers that come and go. I check for these daily but don’t add them to this page as it’d get even longer! To get the latest offers simply subscribe to my email list here or see matched betting sites. Why does Betfair say my bet has been “Unmatched” or “Partially Matched”? An unmatched (or partially matched) bet on Betfair basically means that you’ve ‘offered’ the lay bet but there isn’t enough money being backed to cover you in full at the odds you chose. The amount of money shown needs to be higher than the “Backer’s Stake” figure you put in the betting slip, otherwise it won’t be fully matched. Generally speaking you want the figure to be much higher (ideally over a few hundred pounds) just to give you a nice cushion. You also need to be quick in placing the bet, as the amount available can change in the time it takes to confirm the bet (particularly if the event is starting soon). You can either move on to another event/bet (recommended) or select the odds to the right at a higher price and update your calculations. You’ll get this notice after placing your bet if there isn’t any money available at the odds you chose. Firstly it’s important you cancel this bet immediately, otherwise it could still be (partially) matched! Then go back to the event page and select different odds which have enough money, ensuring to update your calculations (calculator here). In this case, you have no choice but to keep the partially matched bet and will need to match the remainder at the next odds available (check there’s enough money this time!). It’s important to cancel the unmatched part of the bet in case it matches later without your knowledge. If you don’t match the full amount you won’t cancel the risk of the bet with the bookmaker and could lose money. Going for slightly higher odds will have minimal impact on your total profit. The bottom line is to make sure you’ve bet the full liability amount on Betfair to cancel out the risk with the bet at the bookmaker. Can I enter my own figures in the calculator tool? Yep you can click the settings icon (top right) to alter the Stake/Stake Not Returned/Commission amounts. For more advanced usage, or just to play around with outcomes, use our Matched Betting Calculator. You can also get to it via the dropdown on the tool. I assume most people want to get the maximum free bet amount, so by default we automatically set the stake amounts etc for each bookmaker. How does a bet refund offer work? You’ll notice some promotions refund your qualifying bet if it loses (‘risk free’), rather than giving you a free bet after making a qualifying bet. The calculations are a little different, so use our special bet refund calculator. Most refunds are given in the form of a free SNR bet, but occasionally it can be given as cash. Each needs its own strategy which we’ll cover below. The calculator is straightforward to use: type in the stake of the bet, the back/lay odds as usual and the full refund value in the ‘Refund amount’ box. Here the idea is to lay less on the exchange than we normally would as we have something to gain if the bookie bet loses (ie. a free bet). If it wins, we’re done. If it loses, we need to use the free bet to compensate for our losses. Either way we’ll make roughly the same profit. Typically we’ll be able to extract 70-75% of the free bet value into cash and so we’ve pre-adjusted the refund amount to 70% in the calculator to reflect this. No, don’t do it. The bookies are extremely strict on this nowadays, and will ban you if they suspect you doing this. They’ll check your IP, cookies, name, address and payment details at the very least. For actual terms check their site. Do existing users get free bet offers? Yes. Whilst the free bets listed on this page are strictly for new users, every so often bookies will email you with more free bets (‘reload offers’), especially if you haven’t been on their site for a while or a big sporting event is on the horizon. I have a separate email folder for bookmakers and scan through their promos every few days. Join my list to get these reload offers each week here. A bookie's offer is different to what’s in the guide. Help? They can change every so often, simply adjust the figures by clicking the settings button in the tool (top right). The calculations will be updated for you. For more flexibility, use the Manual Calculator. Oh, and please give me a shout to update the guide. I haven’t received my free bet. What do I do? Firstly check the terms on the bookmaker’s website. If you believe you’ve followed them you’ll need to contact their customer services (with your account details). Will matched betting affect my credit rating? Nothing has ever shown up on my credit report. Whilst bookmakers may sometimes carry out a credit check on you (rare), it isn’t recorded and has no effect on your overall score. If you want to check your credit score at any point, you can do so for free (see our guide). How can I lay accumulators? If you’re looking to lay off accumulator bets you’ll need this spreadsheet. Pick events that are at least half an hour apart because you’re going to lay each selection of a bet one at a time, depending on the outcome of the earlier leg. The idea is if any leg on the accumulator bet loses you stop laying on Betfair. If it wins you keep going. Enter your bookmaker stake under “Back Stake”. Under “Multiple Type” select what kind of bet it is (e.g. treble, four-fold etc). Enter the bookmaker odds for each selection in cells F4 to F6. Enter the exchange lay odds in cells G4 to G6. Enter the lay commission in cells I4 to I6. The required lay stake for the first leg the acca will be shown in cell K4. If it loses (on the bookmaker side), you’re done. If it wins, continue to lay off the second leg as calculated in K5. Keep going until a leg on the bookmaker side loses, and remember to lay as advised between each leg. Forgetting to lay between legs (even just once) could be a very expensive mistake! How do I report incorrect information or bugs? Please use the contact form or leave a comment below. For anything else, please use the comments below and I'll get back to you. The discussion for this guide has moved to our private matched betting Facebook Group. Join this list to request access. I have been sharing the guide with friends and family. I’ll keep spreading the word. I feel like I’ve come a long way in the last month, had a lot of ups with only a couple of moments to forget. The ‘biggy’ lost ~£100 after betting on ‘Win both halves’ and laying ‘HT/FT win win’. Lesson learned! Despite the hiccup, I am £881.76 better off as I write this email. With a few free bets expected for tomorrow. You have a fantastic guide that I’m glad I stumbled upon! since the £20 free bet comes in 4 x £5 free bets, how are you supposed to use all 4 of them at the same time? It looks like you can only select one of your free bets at a time? Unless you mean 4 completely new betslips with each of them. Hi, you can use all 4 on the same event (with different bet slips) and treat it as a £20 bet. After the tutorial, the idea is to go through the signup offer table, signing up to one bookmaker at a time and taking advantage of their welcome offer through matched betting. Thanks for the article! I've been having good success with this and started to do multiple matched bets at once. However, I ended up betting on the same games for different websites (E.g betting on the Arsenal vs Leicester game on 888sport and Betway). This is fine for the backing sites, but I'm a bit confused/concerned over what happens on the betfair exchange when you lay 2 different outcomes. I layed Leicester and then later layed Arsenal, but what happened was quite strange. After I layed Arsenal, the backers stake + the liability for the Arsenal Lay was credited to my balance, and the liability for the Leicester lay went down by the same amount as the Backers Stake for the Arsenal Lay. What is going on here!?! Any help is much appreciated. Hi Rob, this sounds odd. I would assume what's happening here though is that Betfair is perhaps noticing that you're betting on the same game and simply cancelling out your other bet with the new one. Personally I would avoid using the same match for this if you're doing multiple at once. Hi, i was just wondering for the free bet offer, just to confirm - it is 4 x £5 on whatever team the calculator is saying? Thanks! Yes that's correct Jillian. Use the 4 separate bets all on the same event. Hi Ryan, you can see on the bet slip for that result that it says "Liability: £36.99". You are confusing the payout for the liability in this instance. The Man U v Palace draw the liability £50.59 and the profit is £50.00 that is a 59 pence loss or am I seeing it wrong. Can someone please explain. Hi Ryan, if you take a look at the best slip in point 6 you can see that the liability is in fact £36.99. The £50.59 value is actually referring to the payout. The free bet must be wagered in full, redeemable on win or each-way bets and can be used on the following listed bet types: single, double, treble, 4-fold and upwards accumulator, forecast, combination forecast, tricast & combination tricast. Free bet token is not valid on tote, or other combination and multiple bets (i.e Lucky 15s). i dont understand these terms of using free bet on coral, according to these terms will i be able to use free bet on draw? Yes you can bet on a draw. That would be a "single" bet which is allowed under the free bet terms. I find this article very interesting! I'm eager to try this out. What happens when you matched a bet on coral to win. On betfair you matched bet on the same game to lost but the game ends in a draw. For example, on coral I predict that Liverpool wins against Sevilla, on betfair I predict that sevilla wins. What if the game ends in a draw? The steps on this guide doesn't account for a draw as a possible third outcome in such scenario. I hope to get a reply to clear my doubts. Thanks for sharing this information. Hi Peggy, it's worth reading the guide again. When you bet on Betfair it's a lay bet. This means you are betting on Liverpool not to win. A draw of course counts as them not winning so you have all bases covered. Hi, I've just been reading this article ( & making notes) I then clicked the arrow on the 1st Oddsmatcher screen, however it instructs you to place bets on both Coral & Betfair for Aston Villa to win on both these sites, erm, isn't this contradictory to what I have just read & learned?! I thought the Betfair lay bet was for betting the opposite outcome to the back bet! Surely it is a typo, & needs amending! This was for A.Villa v Rotherham game scheduled Tuesday 18th September at 19:45. Yes, once you use a bookmakers free bet you move onto the next bookmaker. If you've already received your bet then you can play that as soon as you get it. Are these free bet offers only for new customers? What do you do once you've tried them all, stop? Or do you have to make more accounts? I'm a little confused by the new Betfair screen which only shows a blue button for match odds so I'm not sure if I just placed a lay or a back bet. Any ideas? Charles Graham You need to click on "Exchange" at the top, you're in the normal sportsbook. See Step 4 in the guide. When you add more money to the Betfair account for liability, how do I get this money back? Hi Karina, if you lose on Betfair you won't get this money back. But your winnings from the matched bet on the survey site will cover the loss. Hi Declan, I believe you should be able to get the free bet but I would double check with them first. Why does the instructions on the £50 NetBet free bet suggest that you need to deposit £100? I can't see anywhere in there T&C on the promo that this is required. Hi Nathan, it's showing as £50 for us. Are you still seeing £100? I've registered with Coral and deposited the £5.00, using it to bet on a match this Thursday, but did that before I got the part on Oddsmatcher that said do it "using this promo link", so will I still be eligible for the £20 free bet? I've already done the whole process now as well on Betfair, but I was using the apps, hopefully this doesn't affect it? Hi Elliot, if you got the free £20 bet credited to your account then you should be ok and you can go onto the free bet part of the process. Thanks Jake, the first bet result isn't until Wednesday so I'll hang fire and see. Just out of interest, what would be the case if you already have an account with a betting site, is there no way to utilise matched betting then? Unfortunately you can't take advantage of the sign up offer in that case. However, there's other ways to make money from these sites through rollover bets and other promotions. We'd suggest signing up to a service such as Oddsmonkey for info on this. Hi. How does the calculator work when the free bet offered is different to the amount specified on the calculator? Hi Rob, you can use the manual calculator in this instance. Hi Evana, you can only make a profit on a free bet. Thanks. Hi Jake, thank you for the reply, would you mind explaining why it only works on free bets? Shouldn't it work on a normal £20 bet too (on coral)?I can't figure out why even after a few days. ... Thanks! Every time you match a bet you lose a little money due to the difference in odds and the percentage of winnings taken by Betfair. If you use your own money you'll just end up losing a little each time. The free bet allows you to bet without your money on one of the sites which is why you're able to make a profit.